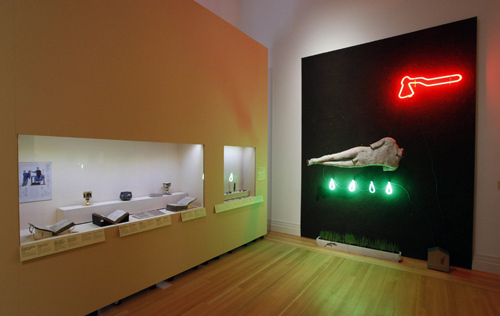 View of “Side by Side,” 2011. Right: Mirosław Bałka, St. Adalbert, 1987. This exhibition, a collaboration between the Royal Castle in Warsaw and the Martin-Gropius-Bau in Berlin, studies the dazzling cultural ties forged between Poland and Germany through over seven hundred works of art produced in the past one thousand years. The first room of the show presents objects from the eleventh century, an era that marked the beginning of the neighborly relations between the two countries. Here, the focal point is the martyrdom of Saint Adalbert, a Czech Christian missionary who was killed in 997 by the Baltic Prussians. Otto III, the king of Germany, visited Saint Adalbert’s grave in the year 1000, and then founded an independent Christian metropolis in Gniezno, Poland. The doors of a cathedral in that city are decorated with figural scenes from Saint Adalbert’s life. An installation inspired by this story is found in Mirosław Bałka’s work in this room: St. Adalbert, 1987. The juxtaposition of historical and contemporary works encourages critical reading of the images. Consequently, a section of the show that explores World War II stresses the ambiguity of photography. We see how the medium was deployed as a tool to classify Auschwitz’s prisoners. However, as Władysław Strzemiński’s 1945 series “To My Friends the Jews” shows, it has also served the victims of the Holocaust as a way to reflect and respond. Gerhard Richter refers to this ambivalence in a section from his Atlas titled Reichstag, 1997–98, where he transforms images of Nazi crimes into the German flag. Curator Anda Rottenberg also presents a smart selection of video and film pieces including Królik po berlińsku (The Rabbit à la Berlin), 2009, by Piotr Konopka, which portrays the postwar history of the Potsdamer Platz via the story of rabbits that lived in the space between the two layers of the Berlin Wall until 1989. Rottenberg’s interest in the power of the individual is also evident throughout the show. A section devoted to the cold war highlights initiatives by Joseph Beuys, Jürgen Blum (Gerard Kwiatkowski), and Elisabeth Jappe. Their works could be considered among the foundation of artists’ solidarity and gestures of resistance, a notion recently challenged by the Martin-Gropius-Bau’s decision to remove Artur Żmijewski’s work Berek/Game of Tag, 1999, from the show in response to the allegations of anti-Semitism from a prominent member of Berlin’s Jewish community. According to media sources, the artist and curator of the show did not participate in decision-making process.